The Twenty-first National Conference on Artificial Intelligence (AAAI-06) and the collocated Eighteenth Conference on Innovative Applications of Artificial Intelligence (IAAI-06) were held in Boston, Massachusetts at the Seaport Hotel and World Trade Center, from July 16–20. AAAI-06 Program Cochairs were Yolanda Gil, University of Southern California/Information Sciences Institute, and Raymond J. Mooney, University of Texas at Austin. Abstracts of the papers (in presentation order). The Calls for Papers Booklet. The keynote address was delivered by Tim Berners-Lee. Lee is director of the World Wide Web Consortium. Invited talks were delivered by Karen Myers (SRI International), Dan Roth (University of Illinois at Urbana-Champaign), Pedro Domingos (University of Washington), and Ken Koedinger (Carnegie Mellon University). The Robert S. Engelmore Memorial Lecture was delivered by Bruce G. Buchanan. Details . . .
For the first time, AAAI-06 had special technical tracks: one on integrated intelligent capabilities (inviting papers that report on theoretical or empirical studies that highlight the role of integration of multiple components in achieving intelligent behavior),and the other on artificial intelligence and the web (inviting technical papers on the use of AI techniques, systems and concepts involving the Web). 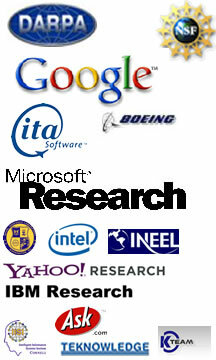 The Technical Program formed the core of AAAI-06. The proceedings contents abstracts, and papers are available in the AAAI member's digital library. Integrated Intelligent Capabilities (a new program for 2006). To learn more about deployed and emerging applications of AI, we suggest you review the materials at the collocated IAAI Conference. For details on the schedule and descriptions for the fifteen tutorials, please consult the tutorial page. The second annual AAAI General Game Playing Competition, held from May to July 2006, ended in Boston at AAAI-06, where Fluxplayer and Cluneplayer met in a final showdown on July 19 to compete for the $10,000 prize. The winner of the competition and the Stanford Prize was Fluxplayer, a general game player created by Stephan Schiffel and Michael Thielscher of Dresden University. Fluxplayer won the competition with a score of 2690.75, beating out second-place finisher and defending champion Cluneplayer of UCLA (which finished with 25.73.75 points) by 117 points. Greg Kuhlmann’s and Peter Stone’s UT-Austin-Larg finished third with 2370.50 points. The AAAI competition was designed to test the abilities of general game playing systems by comparing their performance on a variety of games. The competition consisted of two phases: a qualification round and a runoff competition. Now in its fifteenth year, the Mobile Robot Competition for 2006 included the Robot Challenge, the Human Robot Interaction, the Scavenger Hunt, the Robot Exhibition, and the Mobile Robot Workshop. The AAAI-06 Mobile Robot Competition celebrated AI’s 50th anniversary with a scavenger hunt, where robots hunted for objects like a stuffed Winnie the Pooh. Winning the Scavenger Hunt this year was Kansas State University’s Willie, which used sonar to find ojects inside an area it had previously mapped. Other award-winners included Idaho National Labs (Judges’ Choice Award for Outstanding Human/Robot Interface) and UCLA (Judges’ Choice Award for Outstanding Adaptation of Current Research). In the Human Robot Interaction competition, Université de Sherbrooke swept the award categories, winning the Judges’ and Audience Favorite categories as well as being the overall winner of the competition. Details on the participants are available on page 18 of the program. Additional information is available on the Robot pages. A Call for Participation is also available. AAAI-06 held the first AAAI Computer Poker Competition. The University of Alberta’s Hyperborean won. The bot from Edmonton defeated four other competing bots, including bots from Carnegie Mellon and Monash Universities as well as two privately designed bots to take first place in the Bankroll (0.3925 small bets per hand) and Series Competitions (3wins, 0 losses). BluffBot, the second place finisher, took second in the Bankroll competition (0.0954 small bets per hand) as well as the Series competition (2 wins, 1 loss). Third place in the Bankroll Competition went to Monash BPP (Monash University, Australia). Third Place in the series competition went to GS2 from Carnegie Mellon University, with 1 win, and 2 losses. AAAI-06 Exhibits Showcased Research in Action, and in Print! The IS Demos program showcased state-of-the-art AI implementations and provided AI researchers with an opportunity to show their research in action. Implemented intelligent systems allowed us not only to experimentally validate AI research, but also to make AI research accessible to each other, to the broader scientific community, and to the public at large. The list of demonstrations presented at AAAI-06 can be found in the AAAI-06 proceedings. Additional details are available on page 17 of the program. AAAI-06 exhibitors included AAAI Press, BAE Systems, Cambridge University Press, Elsevier/Morgan Kaufmann, Googe, ITA Software, Inc., K/Team / RoadNarrows, Microsoft, The MIT Press, Mobile Robots, Inc., Springer, and Yahoo! Research. Descriptions are available on page 16 of the program. The historic city of Boston, Massachusetts, on the eastern seaboard of the United States, was a great venue for AAAI-06. Aside from MIT, Harvard, and a number of other nearby colleges and universities with strong AI departments, there was always something happening in this fascinating city. AAAI-06 was held at the Seaport Hotel. AAAI thanks all the hard-working members of the organizing and program committee for their efforts in making AAAI-06 in Boston a success.